Previously published 20/5/16 on PravdaReport. 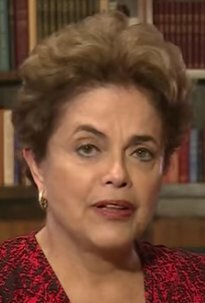 Dilma Roussef, President of Brazil – abstained on UN vote against legitimacy of Crimea's secession from Ukraine, then asks Vladimir Putin for help against CIA-orchestrated coup. A serious political crisis has paralyzed Brazil. 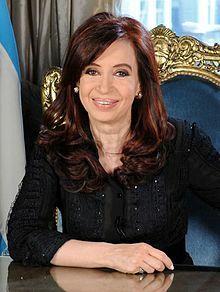 Argentina has changed its president. Venezuela is standing on the brink of violent clashes and a military coup. In Peru, Alberto Fujimori's heiress is coming to power. Why do progressive left-wing parties lose ground in Latin America rapidly? Of course, Nicolas Maduro's remarks about the external factor - the support of the opposition for the United States - are partially true. No external factor can shake up an economically stable and prosperous country. You may say, dear reader, that there is no such country in the world at the moment, as we all still feel the effects of the global financial crisis. This is true, too. However, there are countries in Latin America that have been developing steadily, even if they change governments. It goes about such countries as Chile, Costa Rica, El Salvador, Uruguay. What is the matter then? The matter is about the very basis of everything - economy. In Brazil, Dilma Rousseff (Workers' Party, PT) has not done anything that her predecessors have not done. She has manipulated the budget, borrowed money from private banks to pay social benefits, etc. Yet, the economy of Brazil has been experiencing an unprecedented economic downturn. The opposition of Brazil used the discontent of the middle classes, whose real salaries have been declining from year to year. Therefore, a major corruption scandal that has been raging since 2014 has led to the impeachment procedure and temporary removal of President Rousseff from power. As we all know, the more things change, the more they stay the same. It is hard to believe that Dilma Rousseff will return to her office. In Argentina, it was a strong economic crisis that contributed to the defeat of Kirchnerism (Peronism). In November 2015, pro-American liberal politician Mauricio Macri took office as Argentina's new president. Macri has conducted radical economic reforms, agreed with vulture funds and started borrowing on the international market. At the same time, though, he canceled social benefits, export duties and cut the education system. In Venezuela, President Nicolas Maduro is still clinging to power. He became the leader of Venezuela in 2013, after the death of his predecessor Hugo Chavez. His party lost last year's parliamentary elections, and it is his opponents, the liberals, who hold power in their hands now. Nicolas Maduro also remains under the pressure of the economic factor - low oil prices. The state of affairs was absolutely different ten years ago. A few weeks ago, the first round of the presidential election in Peru ended with the victory of the right-wing candidate Keiko Fujimori, a daughter of dictator Alberto Fujimori. The neoliberal politician may thus replace left-wing forces in Peru as well. The state of affairs was absolutely different ten years ago. Leftist forces were on the rise after Hugo Chavez won the 1998 presidential vote in Venezuela, Lula da Silva - in Brazil in 2002, Nestor Kirchner - in Argentina in 2003, Tabaré Vázquez - in Uruguay in 2004 and Evo Morales - in Bolivia in 2005. During the period from 2006 to 2011, the left won the elections in Nicaragua, Ecuador, Paraguay and Peru. Those victories became possible because of catastrophic consequences of the neoliberal economy in the late 1990s: the deregulation of the economy and the opening of the privatized market to foreign companies. The events resulted in considerable wealth disparity that the local elites paid no attention to at first. ... after the crisis of 2008-2009 ... China ... stopped buying raw materials from Latin America. The left took advantage of social movements of landless peasants in Brazil, Indians in Bolivia, the urban poor in Argentina, etc. PT or the Bolivian Movement to Socialism (MAS) arose directly from those protests. In 2003, those progressive governments saw high demands for natural resources. Bolivia increased its budget six times from 2005 to 2013. Investments from the dynamically developing Chinese economy flowed to Latin America. Those revenues allowed to establish a system of social support for the poorest layers of the population. ... the left-wing governments have not created a base to switch to nationally-oriented economy. They have turned into the countries of one export culture. The results were overwhelming: the eradication of poverty, the rise of education and the formation of the middle class everywhere. However, after the crisis of 2008-2009, global economy has not recovered. In developed countries, including the USA, real wages have not increased over the past eight years. China, the main driving force, stopped buying raw materials from Latin America. GDP in Latin America dropped by 0.1 percent in 2015 for the first time since 2009. Noteworthy, China is the second largest trading partner in the region after the United States, but the main partner for Brazil, Chile and Peru and the second one for Mexico, Venezuela and Argentina. To crown it all, prices on raw materials, especially oil, have declined everywhere. ... 2/3 of 33 million hectares of arable land in [Argentina] that have been cultivated over the past 15 years, were attributed for sowing Monsanto's genetically modified soybeans. This soy goes to China as fodder for beef cattle. It was then revealed that during the well-to-do years, the left-wing governments have not created a base to switch to nationally-oriented economy. They have turned into the countries of one export culture. For example, 2/3 of 33 million hectares of arable land in the Argentine pampas that have been cultivated over the past 15 years, were attributed for sowing Monsanto's genetically modified soybeans. 1 This soy goes to China as fodder for beef cattle. In Brazil, GM crops produced modified mosquitoes that carry Zika virus. Venezuela became a hostage to oil supplies. The changes were accompanied with the aging of the population, rapid urbanization and the growth of street crime. Corruption has skyrocketed everywhere as a consequence of both local mentality and oligarchic structure of the state. Transnational companies will improve their businesses with the help of new privatizations of de-privatized assets. Against this background, the personal enrichment of politicians (the Kirchners have increased their assets seven times) started annoying people. The result of the story is sad. State coffers are empty, the society is divided: the middle classes are dissatisfied and the poor threaten to take to the streets for protests should austerity measures are enacted. Mauricio Macri's first six months in the office show that there is no light at the end of the tunnel. Steel production and construction sector collapsed by 16-20 percent, the public debt associated with the release of short government bonds grows, inflation is rising. Retail prices and the growth of utility bills have tripped the inflation rate from January to April of the current year. The neoliberal offensive may bring fascist regimes to power, such as in Ukraine. In addition, the questionable legitimacy of the change of power in Brazil has politically split the continent. Argentina has recognized the new government of Michel Temer, but Uruguay, Venezuela and El Salvador have not. Who benefits from the turn to liberalism? Transnational companies will improve their businesses with the help of new privatizations of de-privatized assets. The neoliberal offensive may bring fascist regimes to power, such as in Ukraine. In Latin America, this is a tradition. Wolfgang Schäuble, German Finance Minister and Chief Treasurer of the EU, said once: "Elections change nothing. There are rules." This phrase was the motto for the operation conducted by the European Commission to sober up the Greek SYRIZA government in the first half of 2015. Many in Brazil pin hopes to the reaction from BRICS for the non-recognition of the new government of Michel Temer, especially on the part of Russia and China. 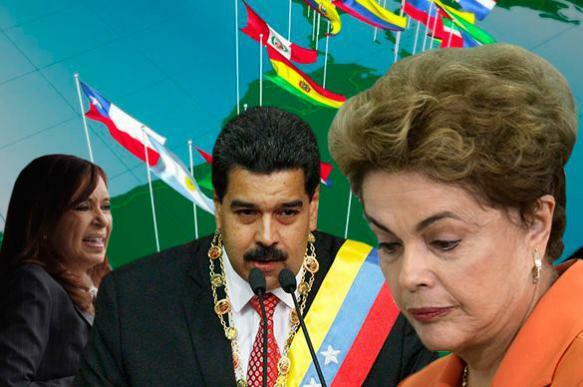 However, where was Dilma Rousseff during the UN vote on the legitimacy of the Russian reunification with Crimea? She abstained. 1. ⇑ One of a number of articles about GMO, and the fight against GMO, is: The March Against Monsanto is On: The Non-GMO Revolution and the Battle against the "Big 6" GMO Corporations (20/5/16) by Timothy Alexander Guzman | Global Research. For most of the recent past, U.S. forces and forces armed and trained by the United States have regularly and violently intervened in the affairs of Latin American countries, establishing brutal autocracies to prevent the expansion of Communism. Barack Obama publicly stated that the days of US interference in the affairs of Latin America were coming to an end. Other leaders of countries in the region have both accused the US of meddling in their affairs recently. This continued controversy reveals the at times bitter history of the relationship between the United States and Latin America. It's about attempting to prevent left-wing governments, particularly those who attempted to nationalise their countries’ industry, from securing power in the region. Significantly, the late Venezuelan President Hugo Chavez frequently claimed the CIA plotted against him. A less obvious case is that of the Chilean military coup against the government of President Salvador Allende on September 11, 1973. Venezuela has the largest certified oil reserves on the planet and will always be a target of the most powerful interests. After Chavez was elected in 1998 and began to implement changes affecting powerful interests, changes that would redistribute wealth and nationalize control over strategic resources such as oil and gas, the U.S. backed a coup against him in 2002 that briefly removed him from power and installed a U.S. selected dictator, businessman Pedro Carmona. Support for Chavez grew and his allies came to power throughout the continent, elected for policies that prioritized social justice and people over profits. One by one, U.S. agencies targeted them, funding coups against Evo Morales in Bolivia in 2008. The clandestine operations, espionage, secret missions, covert funding, psychological warfare and regime change tactics the U.S. has employed in Latin America for decades and continues today.